We are so excited to celebrate Christ, the ultimate gift our Heavenly Father gives us! 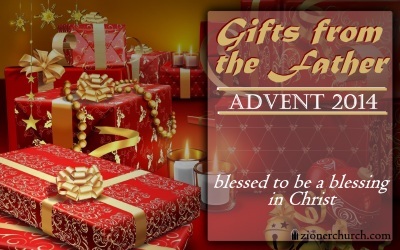 The brother of our Lord Jesus Christ told us in James 1:17, “Every good and perfect gift comes from the Father of Lights, in Whom there is no shadow of change nor turning.” This Christmas, remember that whatever gifts you might count special, you have them because the Father God has given them to you by His grace! Keep this list of dates handy, because there are so many things that we want you to be present with us as we receive presents of grace through Christ by His Spirit! Meet at the church at 3p.m. for caroling, decorating, Christmas carols, and a light supper. Fun for the whole family! Saturday morning at 9:30 a.m., for a hosted brunch and program. Invite your friends and get your tickets! Join us Sunday evening for a special Zion tradition, and stay after the beautiful music for refreshments and fellowship. Begins at 7p.m. All college aged students are invited over to the parsonage for food, fun & games! Come from 7 – 10p.m. RSVP to Pastor Brian & Sam. The prelude begins at 6p.m., and you won’t want to miss hearing our youth recount the meaning of the Christmas story! Service begins at 9a.m. with Holy Communion. Questions? Contact us or email us. Check back frequently for updates, and we hope to celebrate the gifts of our Lord together with you! This entry was posted in blurbs, news and tagged Advent, announcements, holidays. Bookmark the permalink.